The Sri Lankan Government has sought financial assistance from the China-backed Asian Infrastructure Investment Bank (AIIB) for disaster mitigation, waste management and the construction of low-income households for 50,000 families, the Finance Ministry said yesterday. 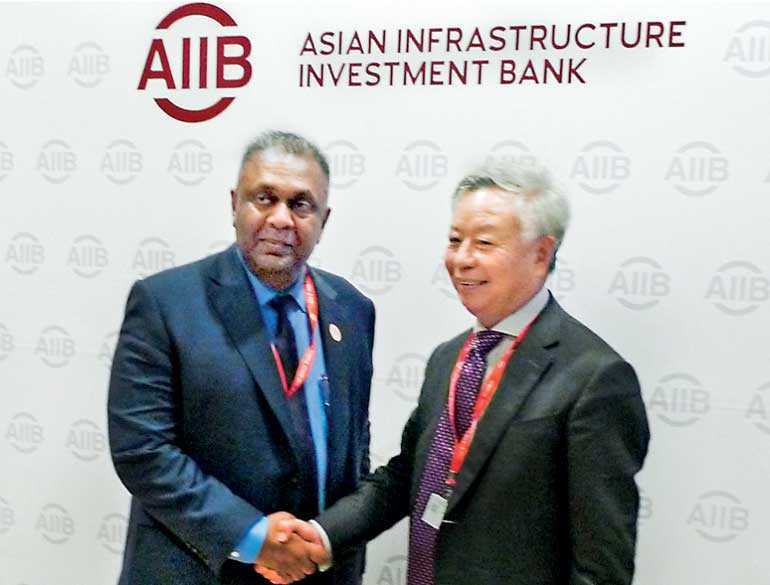 Finance Minister Mangala Samaraweera alluded to the projects during his speech delivered at the AIIB Annual General Meeting in Mumbai this week, which was released by the Finance Ministry yesterday where he praised AIIB for its readiness to assist the Sri Lankan Government. “Especially in line with the Megapolis Development Plan, various development activities have been initiated targeting both economic and social development. For this purpose, we received the assistance of multiple development partners including AIIB,” he said. In addition, the Government has also sought funding for the Reduction of Landslide Vulnerability Mitigation Measures project aimed at implementing mitigation measures and thereby minimising the damage from landslides. “It is evident that both the frequency of occurrence of disasters and their severity have been increasing in the recent past. Therefore, the AIIB collaboration was solicited for disaster risk reduction strategies to minimise the damage,” the Minister added. “Sri Lanka, being an Island, hosts over 100 lagoons and estuaries. The environmental sustainability of those precious water bodies will ensure the wellbeing of many aquatic resources. Therefore, we expect to implement a lagoon development project in the country for which the AIIB could become a strong partner in due course,” he went on to say. Samaraweera also reiterated Sri Lanka’s full commitment to achieve the UN’s Sustainable Development Goals in 2030 that include SDG Goal Number 11 to introduce Sustainable Cities and Communities. The Minister pointed out that currently more than half the global population lived in urban areas. This number is expected to double by 2050 and by then two-thirds of the global population will be city dwellers numbering 6.5 billion people globally. Cities all over the world are adopting various measures to efficiently manage urbanisation which paves the way for sustainable cities, Samaraweera pointed out. Sustainability is a broader concept with integrated social and economic development and environmental management, while ensuring governance and resilience. In the path to achieve sustainable cities, many countries are facing various challenges that include unequal access to public services or inefficient usage of public services, as well as vulnerability to natural hazards, the Minister noted. “Therefore, I am of the view that the main focus of the concept of Sustainable Cities should be on serving the poorest segments of the society by providing better living and working conditions for them by ensuring affordable housing, healthcare, water, sanitation and electricity. In this context, the Government of Sri Lanka has accorded high priority to achieving sustainable development in urban areas, while taking various policy measures to uplift the living conditions of the poor,” he said.